Introduction: Since the advent of modern surgical training, surgeons have acquired their skills and dexterity through a prolonged training process of internship, residency, and fellowship. Due to resident work-hour limitations, surgical residents have fewer opportunities than ever to directly participate in operations and acquire surgical skills. Simulation, most notably in the laparoscopic arena, has served to bridge the gap left by too few training opportunities and too much to learn. Unfortunately, finding an available time and venue for this training has proven elusive. 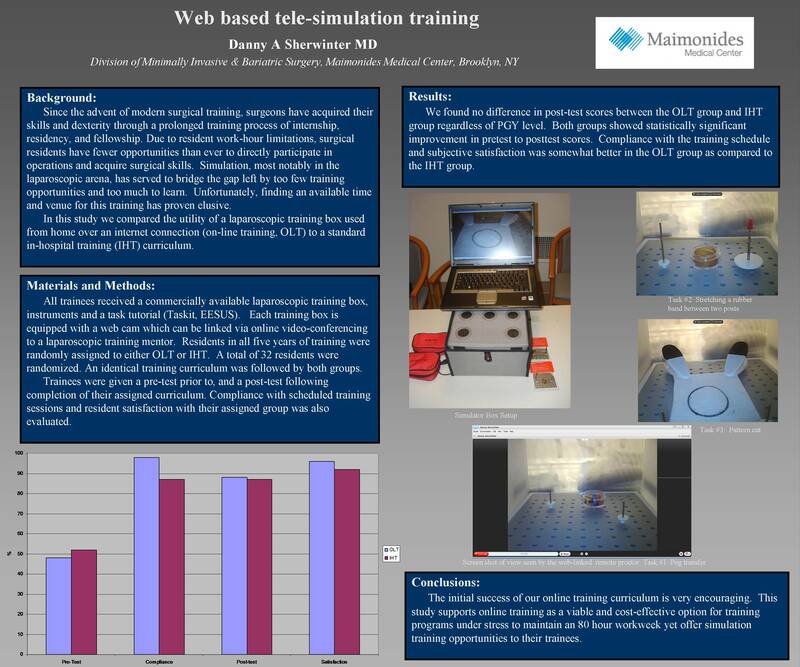 In this study we compared the utility of a laparoscopic training box used from home over an internet connection (on-line training, OLT) to a standard in-hospital training (IHT) curriculum. Materials and Methods: All trainees received a commercially available laparoscopic training box, instruments and a task tutorial. Each training box is equipped with a web cam which can be linked via online video-conferencing to their mentor. Residents in the first three years of training were randomly assigned to either OLT, IHT or no training (control group). A total of 18 residents were randomized. Trainees were given a pre-test prior to, and a post-test following, completion of their assigned curriculum. We also evaluated compliance with scheduled training sessions and resident satisfaction with their assigned group. Results: We found no difference in post-test scores between the OLT group and IHT group regardless of PGY level. Both groups showed significant improvement in pretest to posttest scores as compared to controls. Compliance with the training schedule and subjective satisfaction was significantly better in the OLT group as compared to the IHT group. Conclusions: The initial success of our online training curriculum is very encouraging. This study supports online training as a viable and cost-effective option for training programs under stress to maintain an 80 hour workweek yet offer simulation training opportunities to their trainees.